January 17, 1915 - The initial Turkish offensive into Russia is thwarted as the Turkish 3rd Army suffers a defeat by the Russian Army of the Caucasus near Kars. The Russians then begin a multi-pronged invasion of the Ottoman Empire from the Caucasus. January 19, 1915 - Germany begins an aerial bombing campaign against Britain using Zeppelins. January 31, 1915 - Poison gas is used for the first time in the war as Germans on the Eastern Front attack Russian positions west of Warsaw. Although the Germans fire 18,000 gas shells, they have little effect on the Russians as frigid temperatures prevent the gas from vaporizing. 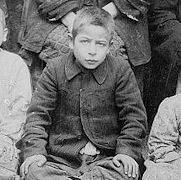 February 1915 - The Turks begin forced deportations of Armenians. 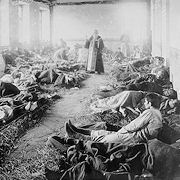 Over the next two years, an estimated 1.5 million Armenians will either starve to death, die of thirst in the Syrian Desert, or be murdered by Turkish troops and bandits, during the Armenian Genocide. February 3, 1915 - Turkish troops launch an unsuccessful attack against the British-controlled Suez Canal, which is regularly used by the British to ferry Dominion troops from Australia, New Zealand and India to European battle grounds. February 4, 1915 - Germany declares the waters surrounding British Isles to be a war zone in which ships can be sunk without warning. February 7-22, 1915 - On the Eastern Front in Europe, the German 8th and 10th Armies wage a successful offensive against the Russian 10th Army in the Masurian Lakes region of East Prussia, pushing the Russians eastward into the Augustow Forest where they are decimated. February 16, 1915 - On the Western Front, the French launch their second offensive against German defense lines in Champagne. Once again they are hampered by the muddy winter weather and a lack of heavy artillery. After a month of fighting, suffering 240,000 casualties, the exhausted French break off the offensive. 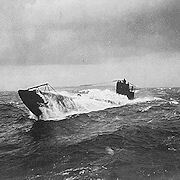 February 18, 1915 - The first German U-Boat campaign of the war begins with unrestricted attacks against merchant and passenger ships in the waters around the British Isles. Within six months, Allied shipping losses at sea surpass the number of new ships being built. However, the unrestricted attacks also arouse the anger of the neutral United States as Americans are killed. March 1915 - The British Navy imposes a total sea blockade on Germany, prohibiting all shipping imports including food. March 10, 1915 - British and Indian troops in the Artois region of northern France attack the Germans around the village of Neuve Chapelle. The attack takes the outnumbered Germans by surprise. The British achieve their initial objective but fail to capitalize on the narrow breach they create in the German lines. After three days of fighting, with over 11,000 casualties, the British offensive is suspended. The Germans suffer over 10,000 casualties. 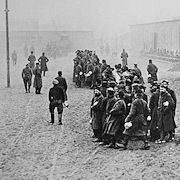 March 22, 1915 - The Russians capture 120,000 Austrians at Przemysl in Galicia. This marks the culmination of a series of winter battles between the Austrians and Russians to secure the strategic Carpathian Mountain passes and opens the way for a Russian invasion of Hungary. Realizing this, the Germans and Austrians make plans to combine their troops and launch a major spring offensive. April 11, 1915 - British troops in Mesopotamia fend off a large attack by the Turks against Basra. The British then branch out to protect their position at Basra, and proceed up the Tigris Valley toward Baghdad. April 22, 1915 - Poison gas is used for the first time on the Western Front as the German 4th Army attacks French positions around Ypres in northern Belgium. 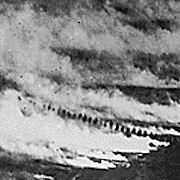 As they attack, the Germans release chlorine gas from over 5,000 cylinders forming poisonous green clouds that drift toward two French African divisions. Lacking any protection, the French quickly retreat. Although this creates a five-mile-wide gap in the Allied lines, the Germans fail to capitalize due to a lack of reserve troops and cautious frontline troops hesitant to venture too close to the gas clouds. British and Canadians then plug the gap but are unable to regain any ground taken by the Germans. The British then withdraw to a second line of defense, leaving Ypres in Allied hands but virtually surrounded. 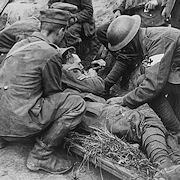 Casualties in the Second Battle of Ypres total 58,000 Allies and 38,000 Germans. April 25, 1915 - Allied troops land on the Gallipoli Peninsula in an attempt to unblock the Dardanelles Straits near Constantinople (present day Istanbul, Turkey) to reopen access to Russia through the Black Sea. The landing comes after a failed attempt by British and French warships to force their way through the narrow Straits. The 70,000 landing troops include 15,000 Australians and New Zealanders. The peninsula is heavily defended by Turkish troops, supplied and trained by Germans. Within two weeks, a stalemate develops as the Allies fail to gain any of their objectives and the Turks begin a series of costly attacks attempting to drive out the Allies. May 1, 1915 - German U-Boats sink their first American merchant ship, the tanker Gulflight, in the Mediterranean Sea near Sicily. 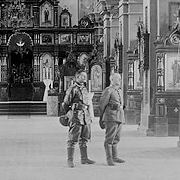 May 2, 1915 - On the Eastern Front, a combined Austro-German offensive begins against the Russian 3rd Army at Tarnow and Gorlice in Galicia. The attack is preceded by a massive artillery bombardment with over 700,000 shells. This breaks down the defenses of the weakened Russians who now suffer from shortages of artillery shells and rifles. 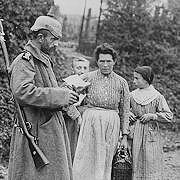 Within two days, the Austro-Germans break through the lines and the Russians begin a disorganized retreat. 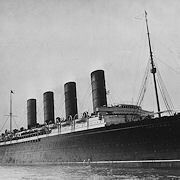 May 7, 1915 - A German U-Boat torpedoes the British passenger liner Lusitania off the Irish coast. It sinks in 18 minutes, drowning 1,201 persons, including 128 Americans. President Woodrow Wilson subsequently sends four diplomatic protests to Germany. May 9, 1915 - Following six days of artillery bombardment by over a thousand French guns, the French 10th Army attacks German defense lines in the Artois, advancing toward Vimy Ridge. 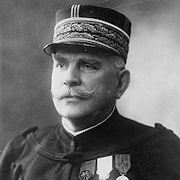 The French achieve their initial objective, but fail to capitalize on the narrow breach they create in the German lines. The next day, Germans counter-attack and push back the French. May 9, 1915 - Complementing the French offensive at Vimy, British and Indian troops launch their second attack against the Germans around Neuve Chapelle in the Artois. 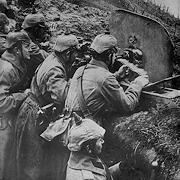 However, without sufficient artillery support to weaken the German frontline defenses, the advancing soldiers are decimated by German machine-gun fire. The attack is called off the next day with 11,000 casualties. May 15, 1915 - British and Indian troops launch another attack against Germans in the Artois, this time at Festubert, north of Neuve Chapelle. The attack is preceded by a 60-hour artillery bombardment. But the troops advance just 1,000 yards while suffering 16,000 casualties. May 23, 1915 - Italy enters the war on the side of the Allies by declaring war on Austria-Hungary. The Italians then launch offensives along the 400-mile common border between Austria and Italy. The better equipped Austrians take advantage of the mountainous terrain to establish strong defensive positions all along the border. The Italians then focus their attacks on the mountain passes at Trentino and the valley of the Isonzo River. May 31, 1915 - The first aerial bombing of London occurs as German Zeppelins kill 28 persons. June 12, 1915 - After pausing to regroup, Austro-German troops resume their offensive in Galicia on the Eastern Front. Within five days, they break through the Russian lines and push the Russian 3rd and 8th Armies further eastward. Russian casualties soon surpass 400,000. June 16, 1915 - The French 10th Army launches its second attempt to seize Vimy Ridge from the Germans in the Artois. This time the troops encounter an intensive artillery bombardment from the improved defenses of the German 6th Army. The French achieve their initial objective, but then succumb to a German counter-attack, just as they did in the first attempt at Vimy. The French call off the Vimy offensive with 100,000 casualties. The Germans suffer 60,000. June 23, 1915 - The First Battle of Isonzo begins as Italian troops attack Austrian defenses. Initial gains by the Italians are soon repulsed by the Austrians with heavy casualties for both sides. Three additional battles are fought through the end of 1915 with similar results, totaling 230,000 casualties for the Italians and 165,000 for the Austrians. July 1, 1915 - Russia creates a Central War Industries Committee to oversee production and address a severe shortage of artillery shells and rifles on the Front. Russian soldiers in the field without rifles can only get them from fellow soldiers after they are killed or wounded. July 9, 1915 - In Africa, the German Southwest Africa colony (present day Namibia) is taken by the Allies following 11 months of fighting between the Germans and South African and Rhodesian troops loyal to the British. July 13, 1915 - On the Eastern Front, the next phase of the combined Austro-German offensive against the Russians begins in northern Poland, with the Austro-Germans advancing toward Warsaw. The Russian Army now gets weaker by the day due to chronic supply shortages and declining morale. Once again, the Russians retreat, and also order a total civilian evacuation of Poland. 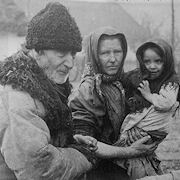 This results in great hardship for the people as they leave their homes and head eastward, clogging the roads and hampering the movement of Russian troops. August 1, 1915 - The Fokker Scourge begins over the Western Front as German pilots achieve air supremacy using the highly effective Fokker monoplane featuring a synchronized machine-gun that fires bullets through the spinning propeller. Although the technology was pioneered by French pilot Roland Garros, the Germans copied and improved the synchronized gun idea after capturing his plane. The Fokker Scourge will last nearly a year, until Allied aerial technology catches up. August 5, 1915 - Warsaw is taken by Austro-Germans troops. This ends a century of Russian control of the city. After taking Warsaw, the Austro-Germans move on to capture Ivangorod, Kovno, Brest-Litovsk, Bialystok, Grodno, and Vilna. 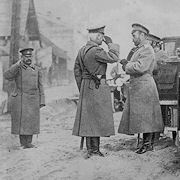 By the end of September, Russian troops are driven out of Poland and Galicia, back to the original lines from which they had begun the war in 1914. For the time being, the battered Russian Army has effectively been eliminated as an offensive threat on the Eastern Front, freeing the Germans to focus more effort on the Western Front. August 6, 1915 - Hoping to break the stalemate at Gallipoli, British renew the offensive. An additional 20,000 troops are landed but their attack is hampered by poor communications and logistical problems. The Turks, led by Mustafa Kemal, respond by rushing in two divisions and the British offensive fails. September 6, 1915 - Bulgaria enters the war on Germany's side with an eye toward invading neighboring Serbia. 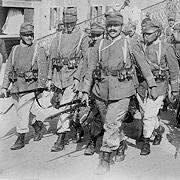 Thus far in the war, Austria-Hungary has tried, but failed, three times to conquer Serbia in retaliation for the assassination of Archduke Ferdinand. Now, the Austrians, aided by Germany and Bulgaria, plan to try again. With the addition of Bulgaria, Germany now has three allies in the war including Austria-Hungary and Turkey. 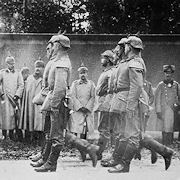 This alliance is called the Central Powers due to their geographic location, primarily in central Europe. September 18, 1915 - The Germans announce an end to their first U-Boat campaign, begun in February, which had targeted ships around the British Isles. This comes in response to increasing protests from the United States following American civilian deaths at sea. The U-Boats are then sent by the Germans to wreak havoc in the Mediterranean Sea, away from American shipping lanes in the Atlantic. September 25, 1915 - On the Western Front, the British use poison gas for the first time as they launch an attack against the German 6th Army in the Artois. Chlorine gas is released from over 5,000 cylinders, creating a poisonous cloud that drifts toward the Germans, opening a gap in their front line. The British advance and quickly seize their objective, the town of Loos, but then fail to capitalize on the four-mile-wide breach in the German lines. The Germans regroup and when the British resume the attack the next day they are mowed down in the hundreds by well-placed German machine-gunners. In all, the British suffer 50,000 casualties during the Loos offensive. British Army Commander John French is then sacked, replaced by Douglas Haig. 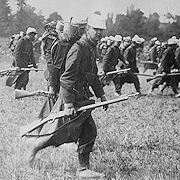 September 25, 1915 - The French 2nd Army in Champagne attacks the weakest part of the German lines, creating a six-mile-wide breach that is three miles deep. The German 3rd Army then rushes in reinforcements, regroups its defense lines and plugs the gap. Facing strong resistance, the French break off the attack. September 26, 1915 - The French launch their third attempt to seize Vimy Ridge from the Germans in Artois, and this time they secure the ridge. 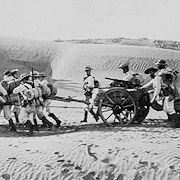 September 26-28, 1915 - In the Middle East, a British victory occurs at the Battle of Kut al-Amara in Mesopotamia as they defeat the Turks. 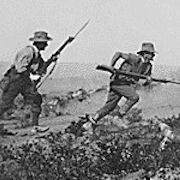 The resounding victory spurs an ambitious move by the British to venture onward to quickly capture Baghdad. However, that attempt fails and the troops return to Kut-al-Amara and dig in. October 6, 1915 - The invasion of Serbia begins as Austro-German troops attack from the north. Five days later, the Bulgarians attack from the east. The outnumbered Serbs have their poorly supplied troops stretched too thinly to defend both fronts. Belgrade then falls to the Germans and the Bulgarians capture Kumanova, severing the country's north-south rail line. This leaves the overwhelmed Serbian troops no option other than to retreat westward through the mountains into Albania. 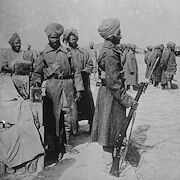 December 5, 1915 - Hoping to overcome their earlier defeat at Kut al-Amara in Mesopotamia, Turkish troops lay siege to the town, surrounding the British garrison there, cutting them off completely. December 19, 1915 - The Allies begin an orderly evacuation of the Gallipoli Peninsula. This comes after months of stalemate in which Turkish troops contained all breakthrough attempts while inflicting 250,000 casualties. The British Navy successfully evacuates 83,000 survivors by sea as the Turks watch without firing a shot, glad to see them leave.